The original SAP idea was to provide customers with the ability to interact with a common corporate database for a comprehensive range of applications. Today many corporations are using SAP products to run their own businesses. System Applications and Products in Data Processing, abbreviated as SAP, is a German software company. It is the fourth largest software company in the world. It provides end-to-end solutions for manufacturing, logistics, distribution, financial, etc. One SAP system executes all processes and there is common information sharing with everyone. It was founded in 1972 by five IBM engineers. Industry-based solutions of SAP include chemicals, postal services, insurance, telecommunications, banking, mining, life sciences, defense and security, railways, professional services, oil and gas, pharmaceuticals, etc. SAP products include SAP xApps, SAP solution manager, SAP ERP (Enterprise Resource Planning), SAP R/3 and R/3 enterprise. It has various functional and technical modules. Ability to provide job roles with authorizations. It is biggest and highest paid specialization field of IT industry. SAP is an IT company specializing in developing business software giving wide range of options for students to be able to work in a wide number of roles which involve advising on and installing SAP software for a range of organizations. SAP (Systems, Applications and Products in Data Processing) produces software designed to make companies operate more efficiently in a variety of areas, including finance, information technology (IT), manufacturing and purchasing. 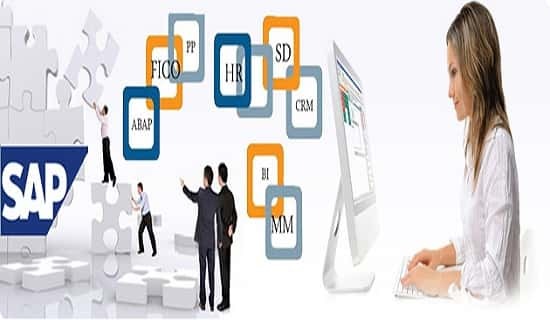 SAP is ERP based software which is useful for all the departments. The SAP has a clear pre-defined life cycle compose of three phases: discovery/evaluation, implementation and continuous business improvement. Training in SAP provides the services that can accompany at every stage of choosing and implementing the right solutions to the problems of the organization. It keeps the student updated with the latest technology. Any candidate who has acquired training in SAP is sure to benefit the company by giving the maximum throughput. SAP Training develops skills and experience in the practical management and application of technology. ➤the curriculum combines business, academic and technical skills to broaden students’ understanding in -the theory and application of information technology in business. Early product training:These workshops and online knowledge products are made available before new solutions or releases are introduced to the general market. SAP academies:These centers specialize in intensive knowledge transfer that builds skills and qualifications for a wide variety of consultants. Consultant certification: Certification helps SAP employers and customers identify and select qualified candidates. Certification is often the end result of participating in an SAP academy, but can also be achieved through alternative learning paths. There are certain prerequisites to be followed before applying for the SAP functional modules. The person has to have the strong programming knowledge and interest in code. It is beneficial to have the educational degree in the program like BE/BTech /MBA/CA etc. with the majors being Computers or IT. Module selection is totally dependent on the candidate based on the coding experience. Each module has its own importance in real time. The candidate can opt for training in technical module Advanced Business Application Program or functional module such as MM, FI, SD etc. Selection can be purely based on interest of the candidate as well. Business terminal of each and every module shows great variation. If the student is good at business analytic then it is advisable to select functional module whereas if the student has inclination in coding then the SAP Training and placement should be taken under the technical module. The students after getting the training in SAP utilize the SAP software’s to determine the changes needed in the company’s business environment and communicate the same to the higher authorities. 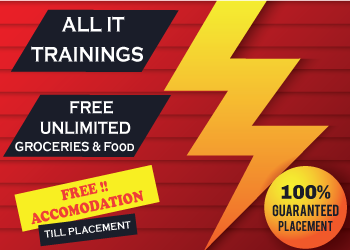 Free SAP training and Placements teaches student to develop, test and implement solutions. The students after being trained can easily fetch the high paying jobs because of the market value of the course. To have the maximum benefit of training courses the students are advised to attend classes in computer programming, systems organization, computer architecture and advanced mathematics. Students also might consider minoring in communications or business to develop the professional and social skills necessary to work with other employees. Some undergraduate programs in IT and computer science require participation in an internship. Not all undergraduate degree programs include enough experience working directly with SAP software programs and applications. To supplement this training, some universities offer SAP certificate programs. Classes often cover software integration, business relations, and customer service and third-party vendor product protocols. The career path for SAP is very strong in the present times as there are many opportunities for the SAP Analyst. The Students during the training program are taught to consider the reoccurring problem within the business organization’s structure. They are brainstormed about the potential problems implementing for the optimal solution. SAP Certification has helped many individuals to achieve their career goals. Training in SAP help get the certification which may not be the ultimate career goal but can definitely give a big breakthrough for the career start. The student gets different certificates for the different training programs undertaken each time. Duties:The position will act as a transformation agent to enable a smooth transition for the end user community from current systems and processes to SAP GRC. Primary responsibilities to include but not limited to testing, training content development and delivery, including ongoing end user support. • Conduct training needs assessments and develop blended education solutions including classroom training, and quick reference guides. Support the Central Enteprise Application Center in Austria, and performing general service requests. The position will also be responsible for support of other applications within North America if necessary in the future. 1-3 years of experience preferred, but consideration will be given for other candidates. Must exhibit leadership project management skills with excellent communication and computer skills.